Car Toys Season 1 is a cartoon puzzle games with animated cars. Get the Police car, ambulance and fire truck, to the right place. There are over 40 levels for you to figure out. In this game you have to finish 48 levels. 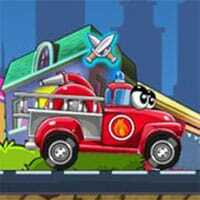 In our new car games , some mad cars are trying to disturb the peace in your beautiful town! Call the Police, Ambulance and Firetruck to help you save the town! There will always be some help available if you get stuck! Enjoy and have fun in playing this free online game. Car Toys is a free online puzzle game on Round Games.